First the cold, then the snow. 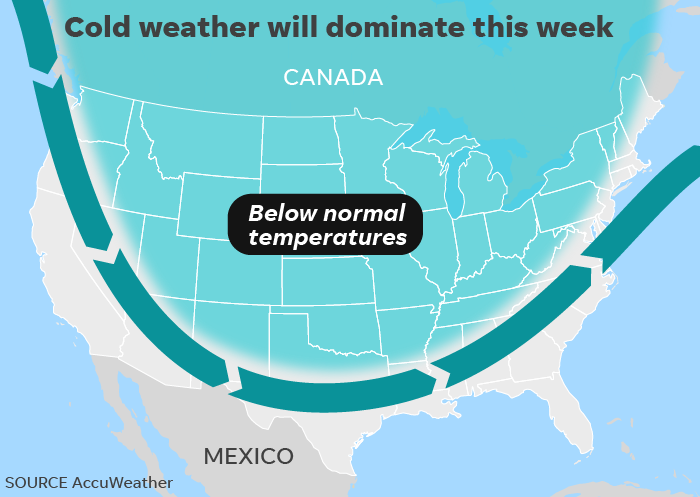 A widespread cold snap that will encompass nearly the entire U.S. this week will be followed by a potentially disruptive snowstorm in the South and East by the weekend. "On Wednesday, temperatures will be near to below average from coast to coast," the National Weather Service said, with some of the most unusual cold expected across the eastern U.S. Overall, temperatures will be some 10 to 20 degrees below average for much of the week, the National Weather Service said. By week's end, cities such as Minneapolis and Chicago will only see high temperatures in the teens and 20s. The cold air comes directly from the Canadian Arctic, the weather service said. 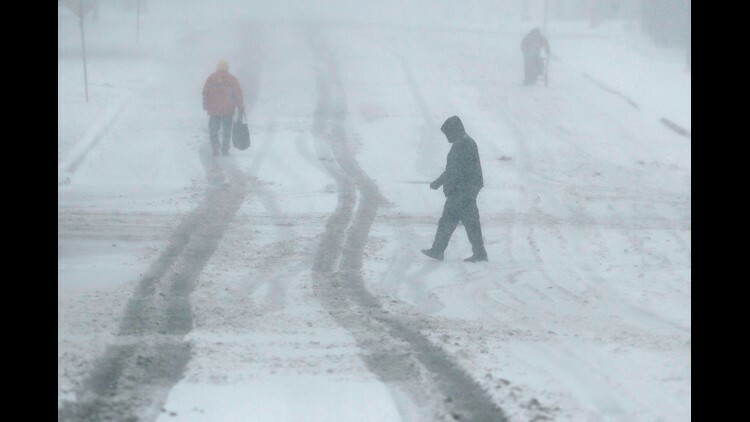 Then, the snow: A storm "is expected to bring a widespread wintry mess of snow, sleet and freezing rain through parts of the nation's southern tier and possibly the East Coast late this week into next weekend," the Weather Channel warned. More specifically, "a weather system will develop and gain strength from Texas into the Southeast U.S. heading into the weekend," weather.us meteorologist Ryan Maue said. "This southern track means the cold air to the north will allow for frozen precipitation, including snow." Although it will be too warm to snow in much of Texas, Louisiana and Arkansas, the state will instead have to deal with severe storms and potential flooding, AccuWeather said. By Saturday or Saturday night. Snow, sleet or freezing rain could affect travel from portions of northeast Georgia into the Carolinas and southern Virginia, the Weather Channel warned. What the storm does by Sunday and early next week is still far from certain. Some of the computer models that meteorologists use to forecast weather show the storm will slide off the Southeast coast of the U.S., sparing the big cities of the mid-Atlantic and Northeast, according to meteorologist Wes Junker of the Capital Weather Gang. Other models show more of a northerly track that could bring significant snow to cities such as Washington, D.C., he said. It won't be until Thursday that meteorologists will get a better sense of the weekend track of the storm.